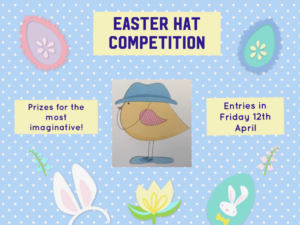 Easter Hat Competition for all pupils. Wear your hat to school on Friday 12th April. Free to take part. Bring in £1 and wear what you like - Spring Colors theme. We finish at 2pm on the last day of term.